Unagi, or freshwater eel, is a Japanese delicacy I have enjoyed many times and I thought I would share my most recent experience of it with you here. 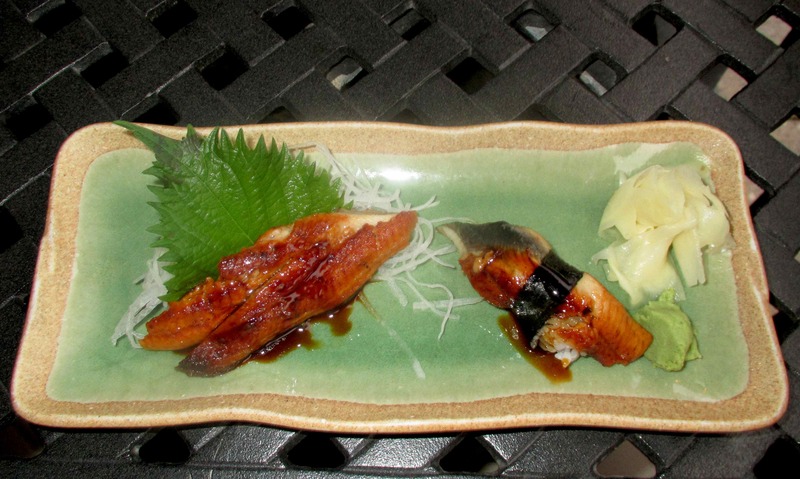 Japanese cuisine also makes use of sea eel (or ‘anago’) but you tend to find unagi appearing much more frequently on the menu at Japanese restaurants. Like octopus and a few other fish products, unagi is always cooked, even in sashimi or sushi preparations. The cooking generally involves grilling but the eel is also sometimes steamed first. Often (indeed, every time I have ever had it) a sweetish glaze is added before grilling, but there is also a ‘shirayaki’ or ‘white-grilled’ version that does without. The glaze, when used, is often a Teriyaki sauce type preparation but here, on this particular occasion, I rather think that actual Eel Sauce formed the glaze. This is more than simply a sauce prepared for eel; it actually contains an extract from eel in the same way oyster sauce contains oyster extract and it has the same sort of sweet, umami flavor.